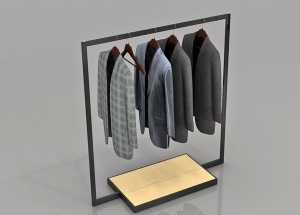 This garment display rack are made by black stainless steel and wood veneer finishes. It's a free standing clothes rack. 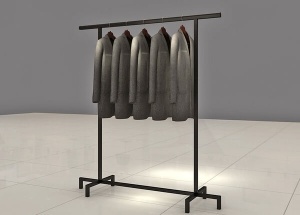 This stainless steel clothing display fixtures are made by silver stainless steel and glossy black baking paint finishes. 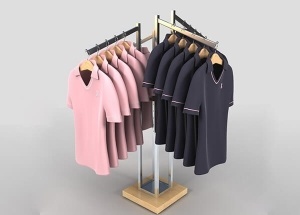 It's a free standing clothing store fixtures with 3 wooden shelves. This metal clothing shelves are made with black stainless steel. contact us to get a free quote now. The wooden display counters are pre-assembled and are made by mdf with tempered glass shelves. We offers standard laminate and veneer finishes this retail display counter with a factory price, and we can also customize finishes to your specification. The glass wall display case are pre-assembled and with 5 glass shelves. 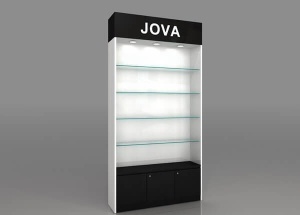 We can custom made it with wooden shelves or acrylic shelves, with glass doors or without doors. 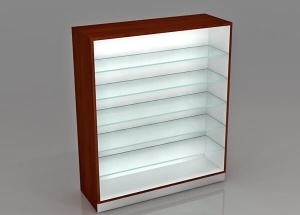 We offers standard laminate and veneer finishes this wall display case with a factory price. 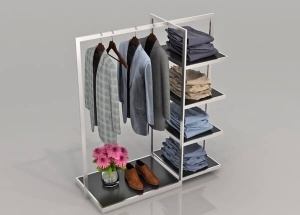 This 4 way garment racks: stainless steel hanger rack, adjustable height, wood pedestal. 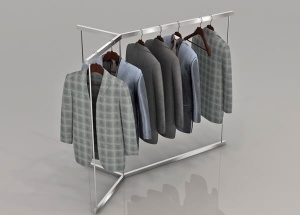 we offer custom made this clothing racks with a factory price. 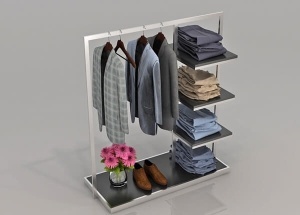 This clothing display shelves are pre-assembled and are made by stainless steel with 4 acrylic shelves. We can also customize finishes to your specification. This stainless steel hanger stand are made by stainless steel and glossy black baking paint finishes. 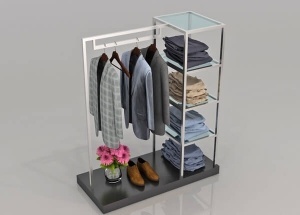 It's a free standing clothes stand with 4 wooden shelves. This 3 way displays are made by stainless steel. It's a free standing clothes gondola for boutique shop.